Max Peg Hook Strip System | Display Strip Product Merchandising | Clip Strip Corp. The MAX Peg Hook Strip System is an excellent way to display your products off gondola shelving and build sales in-store. The Peg Strip Hanger Bracket supports the MAX Peg Hook Strip, it attaches it to the gondola shelving and suspends it right into the aisle drawing attention to the items it displays. 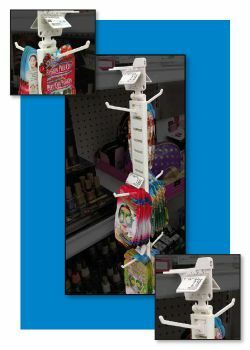 The strip accepts display hooks from both sides - making your merchandise visible going up or down the aisle. Built-in sign holders allow for easy branding, pricing and promotion. Quality construction of white, high impact polystyrene material assures you of strength and durability. Adjustable hook placement accommodates packages of different sizes. Different size Max Peg Hooks and other mounting alternatives are available on a special order basis and may require minimum purchase quantities. Contact us for additional information. Let Clip Strip Corp., innovators in the impulse sales business, support all your POP product merchandising needs. Minimum quantity for "The "Max" - Peg Hook Display Strip, MAX-225" is 10. Minimum quantity for "The "Max" Peg Hooks, MSH-400" is 50. Minimum quantity for "The "Max" - Multi Hanger, MSH-226" is 10.